Our strategy was all mapped out. By comparison, the invasion of Normandy might have seemed less complicated. Private messages and e-mails outlined our plans before my husband, Dave, and I flew into Syracuse, New York, in mid-July. Some may scramble for tickets to concerts, plays and other entertainment. Our quest was laser-focused. We aimed to see as many of our old friends as we could at lunch and dinner before returning to Florida. Up until Wednesday, everything was going according to plan. That night, we hit our first snag when we were getting ready for dinner with my blogging buddies: Mark Murphy, Mark Bialczak and his wife, Karen. Mark Murphy and I became friends after I met him where he worked with my husband, Dave, at the Syracuse Post-Standard. We have kept in touch thru phone calls, e-mail and Facebook ever since we left Syracuse in 1999 to work at Florida Today, a Gannett newspaper based in Melbourne. Our strongest link, besides a warped sense of humor, is a love of writing. Coincidentally, that is also the link I have forged with WordPress blogger, Mark Bialczak. He also used to work with Dave at The Post-Standard. Karen worked at the front desk at the same paper. I worked in radio and at a competing paper, The Observer-Dispatch, in Utica. When we lived in Syracuse, we all often hung out after work at softball games. Sometimes, after a late night at work, we’d also close a local watering hole – Dinosaur Bar-B-Q or Riley’s – and then go to breakfast. Mark Murphy now works at Pinckney-Hugo on West Genesee Street. He showed us around the advertising agency. It was only then that I suggested we call my favorite Italian restaurant in Syracuse – Angotti’s Family Restaurant – for reservations. It was not to be. No one answered the phone. Mark Murphy checked on the web and found it was closed that night as they were on vacation. Arggh! This is where we had arranged to meet Mark and Karen Bialczak. I called them at home. No answer. I called his cell phone. No answer. I left a message both places. Now, I’m not a fussy eater. But my requirement for sustenance this particular night had to be Italian. That is my main comfort food. My phone rang. Mark Bialczak had the perfect place: Rico’s Ristorante. We’d never been there, but it was a delightful choice. Outside the restaurant, I spotted a familiar smile. It was Mark Bialczak. Dave recognized Karen from their days at the daily newspaper. The years just melted away as we talked about old times. Then we chatted about our experiences in blogging, which stories drew the most readers, and most mysteriously, why has the Freshly Pressed Award not smiled upon us. We just shrugged. Our attention shifted back to the food and the great time we were having. Before we parted, Mark Murphy gave me a book he knew I’d love: “Trust Me On This” by Donald E. Westlake. It’s about a reporter who left a respectable newspaper to work at a sleazy tabloid. It’s a wonderful blend “of mystery and hilarity,” so said a Boston Globe blurb on the book. I devoured it on our return trip to Florida and laughed at the outlandish tactics those reporters used to get the story. The author kept me guessing – until near the end – on who had it in for Sara Joslyn, the main character. They are all greatly missed as is Syracuse, the place I still think of as home. Have you met any of your blogger friends and had dinner together? Were you friends in real life first with any of your blogger friends? What would be your go-to dining choice when you get together? 1. 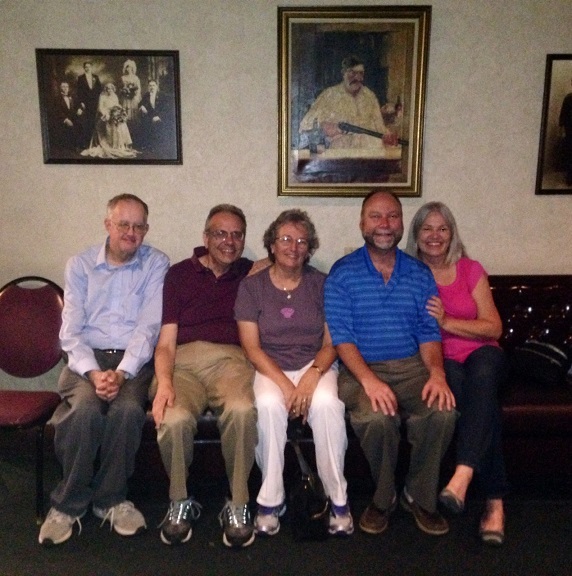 Main Photo: Mark Murphy, Dave and Judy Berman, Mark and Karen Bialczak at Rico’s Ristorante. 2. 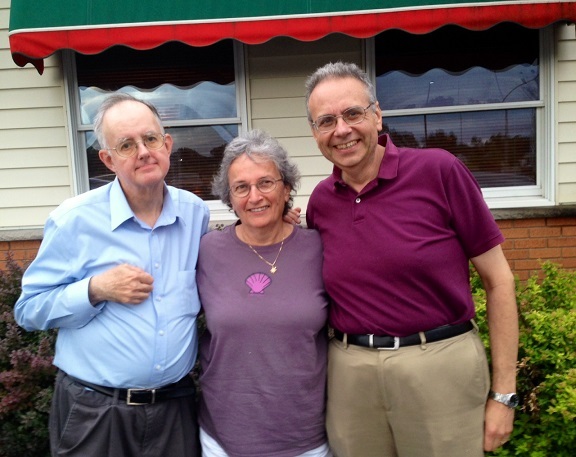 Photo: Mark Murphy, Judy and Dave Berman outside Rico’s Ristorante. 3. Photo: Judy Berman, Mark and Karen Bialczak outside Rico’s Ristorante. Hi Judy, I’ve enjoyed reading about the reunion of two favorite bloggers, you and Mark B. I don’t know Mark Murphy….yet. Yes, it is wonderful to be with people who “get” you. And just today I met a blogger friend for the first time. She was driving all the way from Western VA to Richmond’s airport and stopped here to meet me. It was great! Looking forward to reading more about your trip to yesterday. Thanks, Judy, for your bright light on life. Karen and I had a wonderful time sharing the night with you, Dave and Mark M. Hanging out and loving life. Isn’t that what we’ve learned, earned, and yearned? Here’s to the old days, these days, and days to come. Here, here. I’ll hoist my glass and drink to that, my friend. We did have a great time. Thank you again. I’m so glad that Karen and you were able to join us that night. Lively conversation. Great food. Good friends. Who could ask for more? i think this was so wonderful that you could all get together for a reunion of friends. it is so nice to be with people who understand you and if a bit of time has gone by, you pick up right where you left off. i ended up meeting a blogger, who ended up being local, and a mutual friend of a great friend of mine, who i never crossed paths with, and we’ve stayed friends since meeting. i love both your and mark’s blogs, and it is no wonder that two such talented and kind people have become friends. When you meet folks with a shared interest, time just flies by. The dinner and lunch meets allowed us to spend more quality time with friends. I’m delighted you got to meet a blogger who is now a friend. I’d love to get together with some bloggers to swap experiences. We’re about 50 miles from Orlando. Awww, I hope you get a chance to visit again soon Judy. How wonderful that you got to get together with old friends! I’m glad you were able to find another restaurant that you enjoyed. I enjoyed reading your friends’ versions, too. I haven’t met any blogger friends in person. The closest experience I have to this is meeting people I’ve only communicated with through e-mail. One of my close friends originally contacted me to ask about submitting an article for a book I was working on. We have e-mailed each other for years, after discovering so many common interests (including food), and talk on the phone,too. We’ve met several times, and my husband, daughters, and I even stayed with them in Massachusetts for a few days years ago. She and her husband will be at my daughter’s wedding in August! E-mail, blogging … it’s all written communication. Merril, I’m so glad that you made a good friend thru writing. Your experience emphasizes how the roots of a friendship grow deeper over time. I regret not keeping contact with pen pals I had when I was a teen. One was in Great Britain and another in Germany. Just think of the adventures I might have missed out on. Blogging is so much fun. You start to feel like you really know people. There are a few bloggers I follow who live within an hour or two of me but I’ve never met them. Some bloggers like to be anonymous and some just drop of the face of the world! It’s really great when old friends are blogging buddies too. A trip back to another time is always wonderful and sometimes emotionally exhausting. Sounds like your trip was perfect except for that one Italian restaurant! Kate … We finally did get to that one Italian restaurant. Dave suggested we try again. On Saturday, our last full day in Syracuse, we went to Angotti’s. They had returned from vacation – probably heard my anguished cries from afar. 😉 It was every bit as good as I remembered. I wish it was possible to get together with all my blogging friends. But not like a convention setting. I find that small group encounters provide ample time to really talk and enjoy each others company. I’ve met a couple of blogging friends, and the connection both times was relaxed and natural, as though we’d known each other forever. Another fellow blogger is coming to visit in September. The next time my wife and I go to Florida, maybe we can all get together at an Italian restaurant. Or maybe you and Dave can make plans to come up to Atlantic Canada. You haven’t been Freshly Pressed? That’s a serious oversight. Charles … I’ve read about one of your get togethers with blogging friends and it did sound like fun. If you get to Florida, I know my husband and I would love to meet you and your wife. We have an excellent Italian restaurant in Melbourne that I bet you’d love. But I’m open to many types of foods. 😉 I’m not sure when we’d be in Canada again … but that also sounds like fun. Getting together a group of friends from all around really is more complicated than you’d think, Judy. When our “Five Girl Cousins” finally met in Georgia to clean out our aunt’s hoarding storage shed, it was only after many months of planning. Our plans were more like a blitzkrieg, Marilyn. Like lightning strikes, we were there and then gone – no huge damage in the aftermath except for recovery from the laughter as we swapped stories. 😉 Your gathering in George does sound more involved. But I’m betting it was a lot of fun as well. It’s looks like you squeezed in a lot in short space of time, you must be pleasantly tired now?! 🙂 So why is Italian food your very favourite? I’m not sure what my favourite food is, but I do know that whenever I’ve eaten in a Greek Restaurant whether traditional Greek or just run by a Greek family, oh they really know how to cook and entertain! There aren’t very many where I live and not many Italian either. Why do so many people want to be Freshly Pressed? I’d hate to be Freshly Pressed! Have you seen what happens when blogs get freshly pressed? They get an ENORMOUS amount of likes and comments to the point of overwhelming, and then they go right back to the same people that were turning up before. All the new bloggers who discovered them on Freshly Pressed never come back again. Makes me wonder what the point is? A lot of people use it as a way of advertising themselves. I just feel that’s horrible, and not what blogging is about at all. We did get to see a lot of people and quite a few sites while we were there. Yes, I am now sleeping very soundly as a result. Thanks for fixing the ‘whether’ Judy – magic!! 😀 I forget about the edit, very useful. It would be good if WordPress gave us an edit for our comments submitted. One man even asked me to delete his comment on mine and keep the second comment he’d made, because he really didn’t mean to say what he first did. It wasn’t bad, but I think he was feeling a bit down, and it came out all wrong. It would be less embarrassing if WordPress could let the commenter have the choice of an edit. Maybe one day! It’s a joy and an inspiration to see you having an amazing time with great friends. All your smiles lights up in this post. Thanks for sharing your adventure and friends with us. Have a blessed day. I haven’t met a blogger friend yet but I hope it’ll be something like yours. I think we will all easily connect well with any of our blogger friends. We shared so much of our lives , supported each other in so many ways, it’s pretty much like seeing a very dear friend. Traci … I would have loved to be part of that tea party. 😉 I love reading your stories and know I’d love chatting with both of you in person. Your description of Marian of Plain and Fancy is just as I imagined she would be. Glad you had that opportunity to meet each other. I am glad you had a good time Mom! It is always nice meeting up with old friends! It really was great seeing everyone again, Jenn. 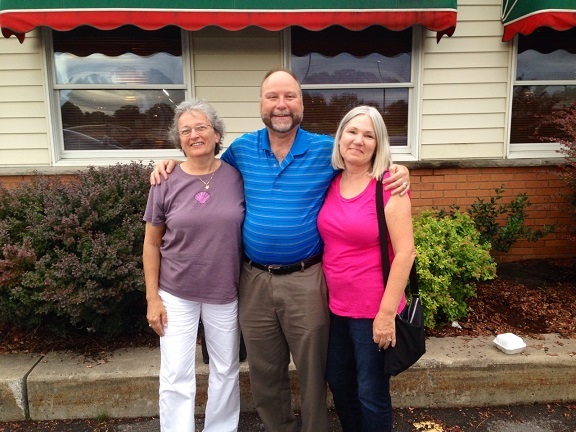 This was such a great post, I enjoy reunions and happy gatherings, Judy! I enjoy knowing a little more about your past experiences, also Mark’s. It helps when I read your comments back and forth, knowing your ‘history,’ Judy! Smiles for the photos and lovely post!